Krissy told me the weight of the moment was overwhelming. Her thoughts drifted to the ultrasound, nobody noticed. She wasn’t prepared for any of this, whatever THIS was. Was he just blind? Krissy, a physical therapist herself, started doing the mental math. She knew Griffin would need braille…what else? A leader dog? Was anything else was wrong? Would Griffin ever walk to school with his brother and sister? Her grandparents were waiting outside the door waiting for news on the babies. This was going to be very rough. It would take two years to finally find out what was wrong. 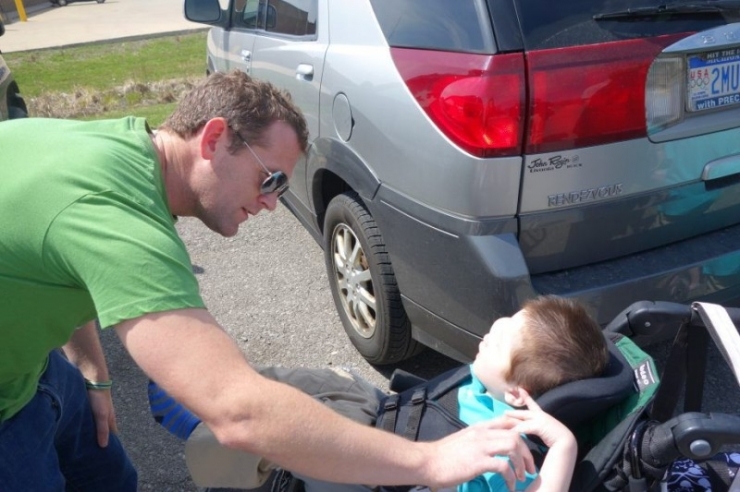 Griffin was diagnosed with SOX2 Amophthalmia Syndrome. SOX2 is a rare genetic disorder (1 in 250,000), and is characterized by abnormal development of the eyes and other parts of the body. That’s just the beginning of the problems, which include seizures, slow growth, delayed motor skills development, and a tendency to overheat easily. It doesn’t stop there. Due to severe stomach reflux and severe esophageal issues, Griffin is not able to eat with his mouth. He must be fed via a feeding tube in his stomach, a liquid diet to bypass his esophagus. Griffin is extremely hard of hearing. You can imagine the number of problems you encounter with a child who cannot see, hear, digest food, or communicate. Cognitively, progress begins with education. Griffin has what’s called an Intervenor. Her job is to create meaningful ideas and sentiments with objects. She must bring the world to Griffin as he is unable to explore it for himself. 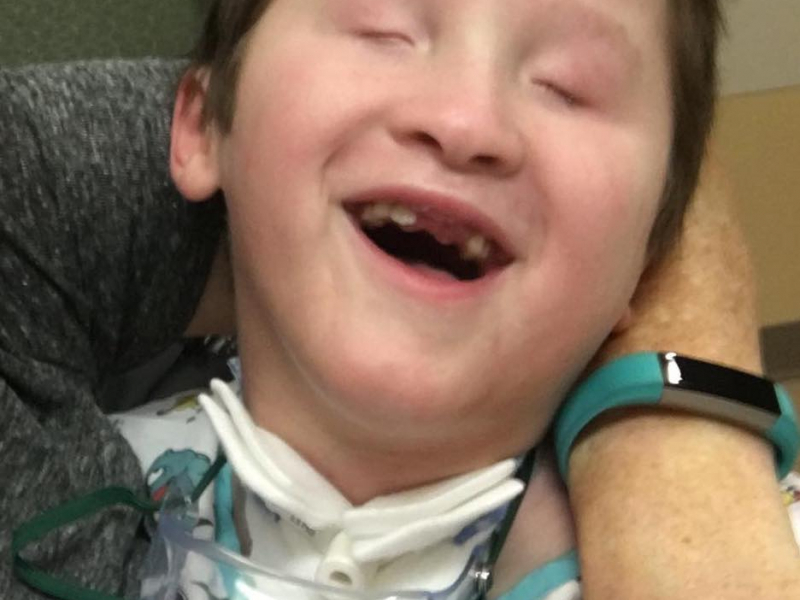 Griffin is slowly learning concepts such as ‘more.’ Griffin’s intervenor Brenda is the only certified intervenor in the entire state of Michigan. Eventually, with more sign language and speech therapy, Griffin will be able to communicate with others directly. With physical therapy, he may walk. Krissy and Heston had budgeted for one child. Financially, three would put the family in the tall grass. But with one of the triplets needing constant specialized medical attention, they were in over their heads. Heston’s job as a construction liaison and environmental consultant wasn’t going to cut it. 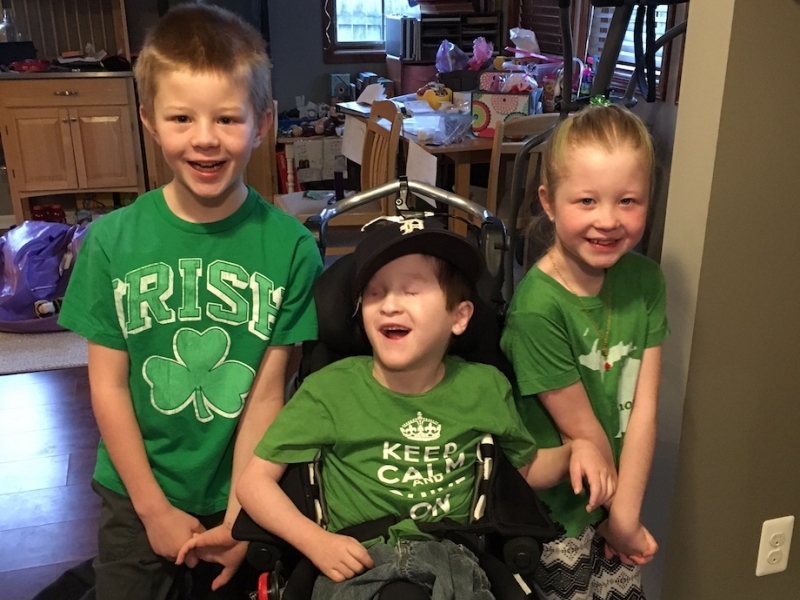 The family had read all of the Chive Charities stories, and applied for a grant from the Chive Fund – not to pay their medical bills, but rather for something you wouldn’t think of. With the kids growing, transportation was becoming an issue. 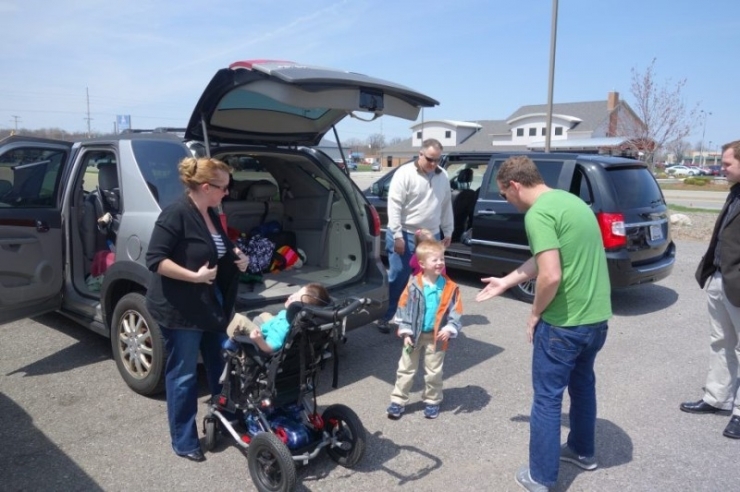 When I asked the Griffin family what they needed the most, they told me they needed a bigger minivan. 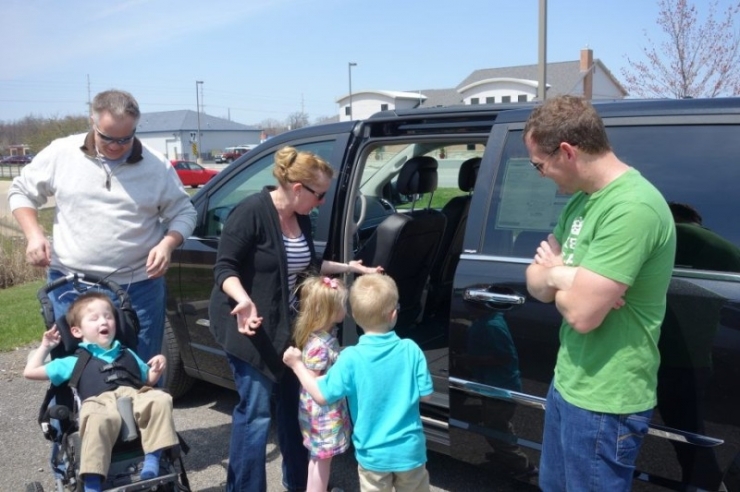 With the kids growing, Griffin needed a special backloading wheelchair lift and space to accommodate it. A new minivan would solve two problems: that of space, and also the rear climate controls would keep Griffin from overheating so often. Last weekend I flew from Los Angeles to Northern Indiana to meet with the Stein family and Griffin over the weekend. I told them I wanted to learn more about Griffin (which I certainly did), but first I had a little surprise for them. 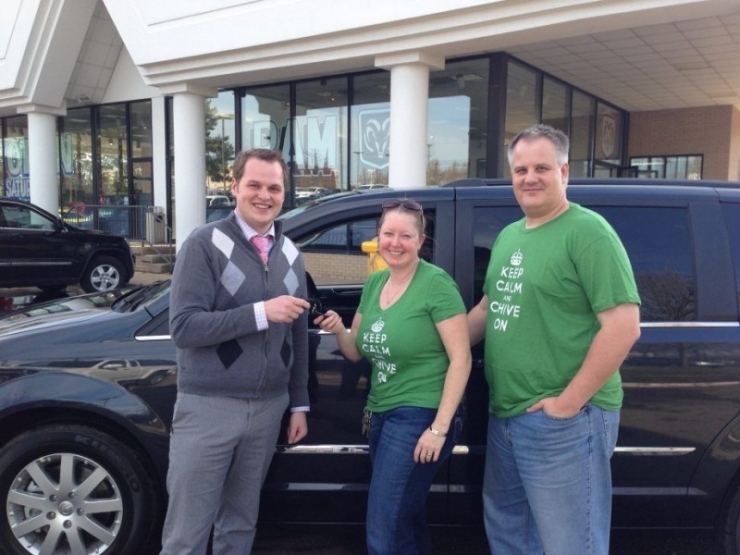 A brand new 2013 Chrysler Town and Country Minivan already paid in full by the Chivers and the Chive Fund. Preston from Preston Suburban Chrysler drove the minivan down to our rallying point, a Buffalo Wild Wings somewhere near Angola, Indiana. The Stein family drove down from their home in Royal Oak, Michigan. There, I met Griffin for the first time. I had no idea what to expect. Certainly I didn’t expect what I saw; a young boy, surrounded by his beautiful sister and brother, and they were all laughing. Griffin responds to touch in the most amazing way. 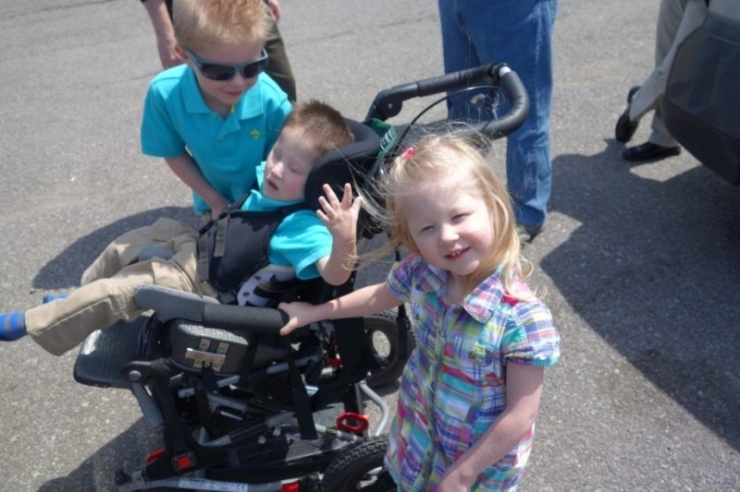 Even at the age of 4, his sister Kaylee makes sure to touch Griffin when she’s talking to or about him. They don’t want to exclude him from anything. Griffin is their best friend. The family and I went inside. They talked, I learned. Perhaps the greatest blessing was that Griffin did not arrive in the world alone. He has two siblings, Logan and Kaylee. Krissy told me: “They have a way of loving Griffin that amazes me.”Griffin will be excluded from so many things in his life. And yet, for his family, the only person who makes it all better is Griffin. He laughs constantly, he responds to familiar touch; it’s how he recognizes you. When I met Griffin I could feel him searching my hands for my identity. He would repeat the gesture when we said goodbye, no so much to identify me this time, but to remember. Griffin is clever in ways we’ll never understand. I spoke to Heston when we left. 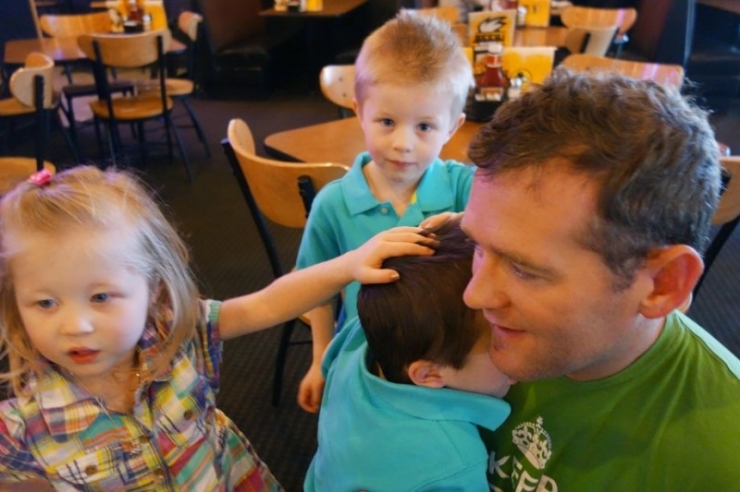 He recalled a story of when he told his mother about submitting an application to Chive Charities. She didn’t understand, “Heston, so this website, with funny photos and girls, is going to help the family? Are you ok?” He told his mother that this website’s community could make miracles happen. Heston told me he believed we would call every night for two months and never lost hope. Until one day he was pulling into the parking lot, the phone rang. All of this was made possible by the Chivers who donate monthly to theCHIVE fund. 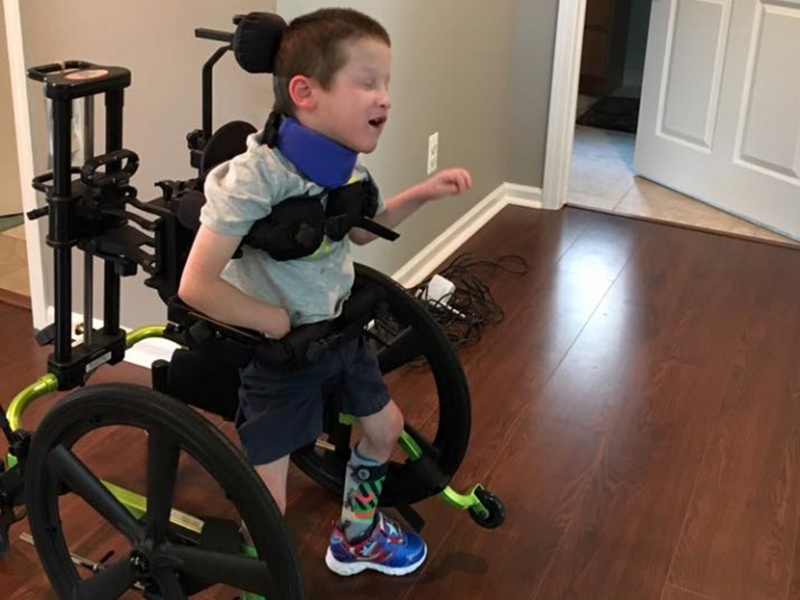 Your small sacrifice has already made Griffin’s life so much better. The Chive Fund has done its job now. But after meeting with Griffin, something tells me his story is just beginning.